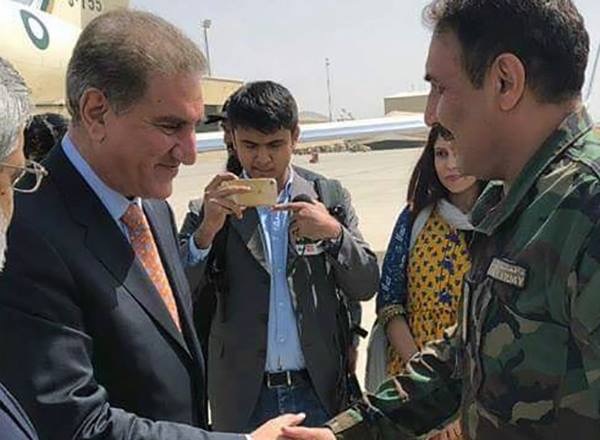 Foreign Minister Shah Mehmood Qureshi has offered in a meeting with President Ashraf Ghani to train Afghan police in Pakistan. The first meeting between Pakistan’s new foreign minister and the Afghan president was supposed to be 45 minutes but, according to reports, appears to have run on for an hour and 35 minutes. Mr Qureshi and President Ghani discussed issues of mutual interest and the return of Afghan refugees to their homeland. The Foreign Minister invited the President to visit Pakistan, an offer Mr Ghani accepted. 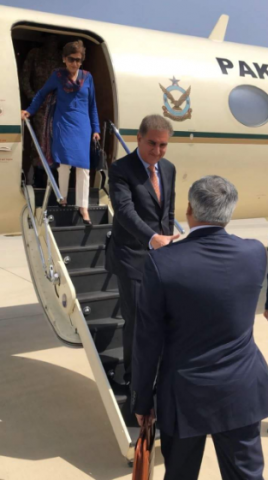 Qureshi arrived in Kabul September 15, Saturday, for his first official visit after taking office. It was a one-day trip. He was scheduled to meet his Afghan counterpart Salahuddin Rabbani, President Ashraf Ghani and chief executive Abdullah Abdullah. He is accompanied by Foreign Secretary Tehmina Janjua. His visit comes barely two weeks after the Americans came to Pakistan. On September 5, US Secretary of State Mike Pompeo along with Chairman of the Joint Chiefs of Staff General Joseph Dunford met Pakistan’s top civil and military leaders — Prime Minister Imran Khan and Army chief General Qamar Javed Bajwa. Pompeo said afterwards that they talked about business ties and ending the war in Afghanistan. What stands out from the agenda is the push to move Pakistan Afghanistan relations beyond security. It appears that making it easier to do business will be put on the table. There seems to be an understanding that lasting peace and success in Afghanistan will not be possible only through the use of force. The most important point is that the relationship needs to be seen beyond security and through the need for better trade and economic ties. The officials will be discussing some of the basics: a brief overview of Afghanistan and its geostrategic significance. They will talk about the implications of the security environment on Afghanistan and the region and Pakistan in particular. They will be analysing the security and economic dynamics by talking about what the major stakeholders see as their interests. They will be talking about the “Afghan security calculus” which is army-speak for a typical appraisal of the Afghan demographic makeup and interests of internal and external stakeholders and their impact on the relationship. They will discuss irritants in the relationship and how disputes are resolved. One point mentions “trilateral convergences” which signals the involvement of a third country but no specifics have been given. Pakistan’s consulate in Jalalabad is expected to be discussed during Qureshi’s visit. On September 1, Pakistan temporarily closed its consulate in Jalalabad, citing “intervention” by the provincial governor and a lack of security. In a letter to the Afghan ministry of foreign affairs, Pakistan’s embassy in Kabul also requested that the governor of Nangarhar province refrain from interfering in the functioning of the consulate. On September 3, Afghanistan Foreign Minister Salahuddin Rabbani assured Foreign Minister Shah Mehmood Qureshi that the security at the consulate will be restored to the level provided on August 28. Rabbani congratulated Qureshi on his appointment as foreign minister and extended an invitation to visit Kabul, which he accepted. Discussion on the resumption of quadrilateral peace talks – which were suspended after Taliban chief Mullah Mansoor was killed in a drone strike – is also expected to take place. The Trump Administration has been accusing Pakistan of helping Afghan Taliban and its Haqqani network who have staged attacks in Afghanistan. Pakistan denies this.